Health professionals commonly use gait speed in the evaluation of functional status in older people. However, only a limited number of studies have assessed gait speed in the absence of disorders of gait, using confounding factors and exclusion criteria coming from studies conducted in younger people. Our study aims to analyse which factors are associated with gait speed in older people with normal clinical gait. An observational cross-sectional study was conducted in 119 community-dwelling residents without relevant comorbidities (Charlson index < 2), preserved function (Barthel > 85) and normal gait by visual exploration. Exclusion criteria included suffering from any illness that could modify the characteristics of gait, terminal status or the presence of an acute medical illness in the past 3 months. We used a stepwise linear regression of several variables (sociodemographic characteristics, cognition, body composition, drugs, falls, sarcopenia, frailty and physical activity) on 6-metre gait speed. The mean age was 78 years (range 70–96 years) and 71.4% were women. Variables that remained associated with gait speed in the multivariate final model were age (B = − 0.020, p < 0.001); gender (B = − 0.184, p < 0.001); waist-to-height ratio (B = − 0.834, p = 0.002); number of falls (B = − 0.049, p = 0.003) and the number of Fried’s frailty criteria (B = − 0.064, p = 0.019). 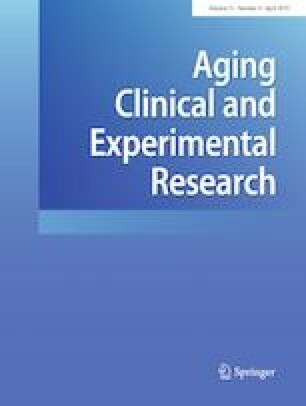 Falls, frailty and the waist-to-height ratio modify gait speed in older people with normal gait. Studies analysing the potential effect of several factors on gait speed should consider them as confounding factors. Funding was provided by ISCIII PI11/01068, and CIBERFES CB16/10/00464 and co-funding was by Feder. All procedures performed in the studies involving human participants were in accordance with the ethical standards of the institutional and/or national research committee and with the 1964 Helsinki Declaration and its later amendments or comparable ethical standards.